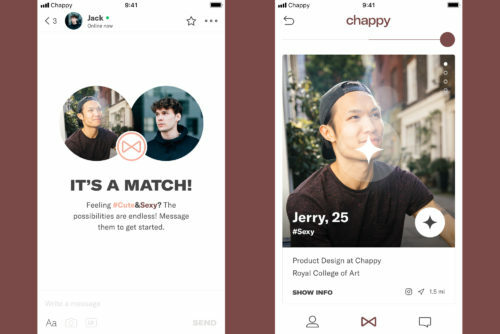 Chappy, an app designed for gay relationships for “one night or forever,” is relaunching, but with some strings attached. Behind a new look and feel are updated policies designed to make for a safe, abuse-free environment for its users. Two of the founders of Chappy – Ollie Locke and Jack Rogers – stepped down last month. The app has since announced a full redesign, clipping things like “Mr. Right Now” in favor of softer terms, and moving to a peach and maroon color scheme. It’s more than just a color change, as the site is moving to a stricter zero-tolerance police for abuse or bullying on the app. “At its heart, Chappy is engineered to empower gay men to form positive, healthy relationships based in kindness and mutual respect, and that’s something I’m extremely passionate about,” Sam Dumas, an executive at Chappy, told Gay Star News. The new policies will be more than just someone coming into the app to hurl hate speech at members, but will extend to the use of statements like “No Asians” and similar in their public profiles. Safe environments for dating apps is becoming a hot button issue, with leader Grindr also soon to launch its “Kindr” program in an effort to foster a more inclusive community on their app. Scruff is also taking steps to address discrimination by race on their platform, no longer requiring ethnicity on a user profile. This could be used to filter results. The Chappy app has 630,000 registered users, but it is unclear how many of them are regular users.